This is the third in a 10 part series looking at how contract cheating has changed since the term was first publicised in a research paper and presentation in June 2006. One of the lesser spoken about developments in contract cheating has been the emergence of a whole group of writers who are willing to create original work for students. On the face of it, academic writing services (as these are commonly known), do not look to offer the most appealing employment prospects. The work can be repetitive and includes long periods sat in front of a computer screen. The work is seasonal and demand unpredictable. And, this work is helping students to cheat, an area which should raise ethical concerns for anyone involved in the industry. So, why do people complete assignments for others and how in demand really is this work? This contract cheating blog post sets out to explore what’s involved. Who Writes Essays For Other Students? There are examples all over the Internet of people who have signed up for online writing jobs, expecting to be writing feature articles or web content, only to discover that most of the work was academic in nature. Other people have signed up looking to deliver tutorial services, only to find that most of the work was actually doing all of the work for students. Vic Boyd tells one such story in the Times Higher Education, talking about a website opportunity she was offered that stated “Develop your academic writing career online!” It turned out to involve writing work for students. The money involved in writing academic work for students can be good, particularly for writers who are skilled enough to identify assignment types that they can turn around quickly and achieve a high wage for. The Shadow Scholar, Ed Dante, for instance talked about making more than $66,000 USD a year as a ghostwriter for student work (and later published a book and a series of blog posts about his academic ghostwriting experience). Others have discussed how writing work for students is one of the most lucrative forms of writing jobs out there. An unusual culture of writer has developed who state that they would have preferred a lecturing position, including people with PhDs. Their academic writing work may then have come about through necessity. I write for an essay mill. The pay can be really good, $50 for an hours work? Ok! Got my PhD in history, but the schools chose to cut jobs and create online courses. BBC Radio 4 featured an interview with a UK academic ghostwriting (a summary is available here). He expressed that he was offering this service as revenge for not being able to obtain an academic position. Several examples have emerged of graduates from a UK degree then moving overseas to their home country and offering assignment production services. They would take the skills that they’d developed during their degree and would hence be in demand. The article, A Close Encounter With Ghost-Writers, explores several such cases. It also identifies very qualified writers, such as those with doctorates and those with experience teaching in higher education – all areas that I’ve explored in my own research. One of the most concerning developments is the set of writers who look at this as a valuable career path. On the face of it, academic writing for students can be a good profession. There’s flexibility to work from home and to not need to keep set hours. It can fit around other responsibilities. It is brain work, rather than manual work. And, there is the potential to earn well for people who know who to identify the correct links. But, most of the ghostwriters that I’ve identified in this field seem to be more the equivalent of web content writers. That means, they’re like those people who turn out multiple low quality blog posts every hour, receiving only a few dollars back for a day’s work. From my observations, the lower end of that pay scale is a much more common pay rate for writers, particularly for those in developing economies or whom English is not their first language. A page is approximately 275 words, so writing can cost under 1c per word. Still, rates such as these can be considered high in many economies, particularly where work of any kind is in short supply. I’ve even seen examples where freelance workers have asked not to be paid more, for fear that it could bring unwanted attention to them. Would You “Pay To Work” As An Academic Writer? A further interesting development is the market in people helping others to get academic writing jobs. There are whole online communities where writers discuss the different essay industry providers and try to identify which sites are the best to work for. A whole black market in developing and selling accounts for essay writing firms has also developed, aimed at those writers who can’t easily get their own accounts. Although much of this is done through private communities, there are some examples visible on public sites, such as Facebook. As the image shows, the range of accounts available is huge, covering many popular academic freelancing sites, some of which even have an account balance waiting to be withdrawn. This particular example is largely for the writing market in Kenya, one of many locations where writing jobs are sought after. 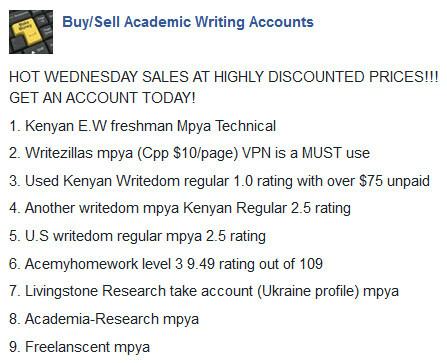 The rates for buying writing accounts such as these are not cheap, ranging from anything from $100 USD at the lower end, to $1000 USD for established accounts at the upper end. That would take some time to pay back at the bottom end rate of $2 USD per page. There is also always the risk of accounts being shut down once transferred, particularly if the new owner receives poor feedback. Should We Address The “Writing Providers” For The Essay Industry? These are just a few examples of the power behind the online writing industry, particularly when it’s accompanied with many more writers than are ever needed for the demand that is out there. Indeed, there are workers who have complained about the internal competition within the writing industry bringing wages down. I’ve only included a few examples of the types of writers completing assessment for students here. There are many more examples in the recent talks and keynotes that I’ve delivered. Indeed, the whole field of who writes what and why is much more complicated than this. I’ve observed a writer online who only likes to take on high level work at MSc or PhD level as he relishes the intellectual challenge. I’ve also spoken to a writer who is happy to complete work on a variety of subjects, regardless if he has any personal experience, but draws the line at subjects that causes him ethical concerns, such as nursing. Nevertheless, there is good work available for writers who understand the marketing side of the business, how to develop student links and how to charge more for the work that they’re doing. From an academic perspective, we need to be continuing to address all sections of this writing business. How can we identify the low-end writers who turn out continual turn-key type assessments, but clearly do enough to pass? And, how can we make producing high end assignments impossible, even though there is a lot of money moving around here, so clearly incentives from the writing side for this to continue? The essay industry continues to be a complex beast.